A grand mystery reaching back centuries. A sensational disappearance that made headlines around the world. A quest for truth that leads to death, madness or disappearance for those who seek to solve it. The Lost City of Z is a blockbuster adventure narrative about what lies beneath the impenetrable jungle canopy of the Amazon. After stumbling upon a hidden trove of diaries, acclaimed New Yorker writer David Grann set out to solve "the greatest exploration mystery of the twentieth century:" What happened to the British explorer Percy Fawcett and his quest for the Lost City of Z? In 1925 Fawcett ventured into the Amazon to find an ancient civilization, hoping to make one of the most important discoveries in history. For centuries Europeans believed the world’s largest jungle concealed the glittering kingdom of El Dorado. Thousands had died looking for it, leaving many scientists convinced that the Amazon was truly inimical to humankind. But Fawcett, whose daring expeditions helped inspire Conan Doyle’s The Lost World, had spent years building his scientific case. Captivating the imagination of millions around the globe, Fawcett embarked with his twenty-one-year-old son, determined to prove that this ancient civilization--which he dubbed “Z”--existed. Then he and his expedition vanished. Fawcett’s fate--and the tantalizing clues he left behind about “Z”--became an obsession for hundreds who followed him into the uncharted wilderness. For decades scientists and adventurers have searched for evidence of Fawcett’s party and the lost City of Z. Countless have perished, been captured by tribes, or gone mad. 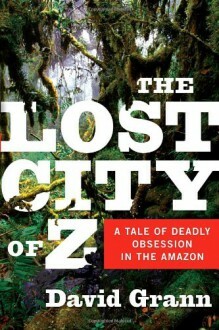 As David Grann delved ever deeper into the mystery surrounding Fawcett’s quest, and the greater mystery of what lies within the Amazon, he found himself, like the generations who preceded him, being irresistibly drawn into the jungle’s “green hell.” His quest for the truth and his stunning discoveries about Fawcett’s fate and “Z” form the heart of this complex, enthralling narrative. 4.5 starsEven though this is a nonfiction book, it reads like an adventure story, great writing. I really liked it, and I'm looking forward to seeing what to do with it in the movie.